You’re not supposed to judge a book by its cover, are you? I’m afraid I did. 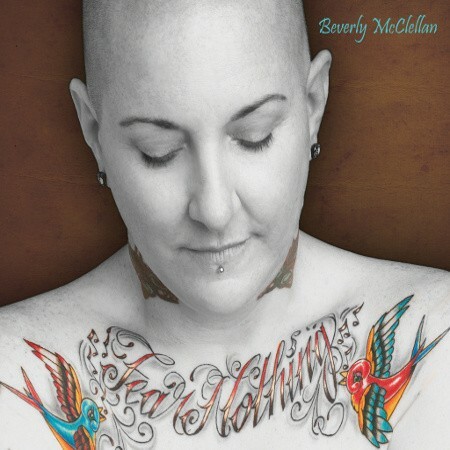 I’d not heard of Beverley McClellan before, the reason being she rose to prominence on ‘The Voice’, one of those shows I despise so much which create stars out of people via the medium of television and a panel of judges. She was on the American version of ‘The Voice’, which I ignored just as much as it’s British counterpart, but I do know the idea on our version was that the judges listened with their back to the artist in order not to be swayed by the visual appearance. In Beverley’s case, that’s probably wise, because when I saw the album cover I saw she is a bald, pierced and tattooed figure with a stern expression. It comes as no surprise when you see the photo that she’s openly lesbian and her appearance seems to dare you to have a problem with that. It was at this point I felt that, all things considered, it’s unlikely I’d get much out of this record. That’s where things went awry… because it’s actually rather good. The music is authentic blues fused with some rock, topped off by McClellen’s strong voice. ‘I See Love’ is a great opening number with acoustic guitars and a delta vibe, ‘Lyin’ To Me’ has a great swing feel to it, ‘Ain’t Me’ is a superb blues track with an old school R’n’B groove to it, before she reinterprets the old Blind Willie Johnson chestnut ‘Nobody’s Fault But Mine’. Those opening four songs give a good indication of what to expect from the record. Blues is very much the order of the day, backed with excellent playing and a crisp production. McClellan brings not only a good voice to proceedings, but pens most of the material herself and plays a variety of instruments. She also managed to attract attention from Steve Vai who signed her to his label and had her contribute vocals to his ‘The Story Of Light’ record. They were supposed to tour the UK together but sadly Beverly had to pull out due to personal reasons. None of the songs are bad, my favourite was the catchy ‘Love Will Find A Way Out’ which has a great chorus. This album is a good blues record – I did feel it was a little too long with a few too many tracks, but I have the tour edition which has more songs than the standard. I enjoyed listening to it, but I do think a little more variety in either style or tempo would have done wonders.